The film “The Lost Tomb of Jesus” is made up of three stories which are intertwined like the strands of a rope, each one intended to lend support to the others. The first is the story of the investigative reporter, Simcha Jacobovici, and his team. It is their work which leads to the discovery of the tomb and to the deciphering of its contents. Once hidden, the “true” tomb is now revealed for all to see. The second story is essentially a new “Gospel,” built, in part, upon the New Testament gospels (though, greatly scrutinized and reduced) but merged with legendary morsels derived from apocryphal gospels. These apocryphal gospels, written centuries after the events they depict, were acknowledged to be fictitious stories when they were written. Finally, this already fictionalized story is supplemented by the filmmakers with modern story elements such as the idea of a married Jesus who also has children. The third story is that of the experts—the scientists, statisticians, archaeologists and epigraphers whose testimonies become the pillars of wisdom which appear to support the investigators and their new Gospel. 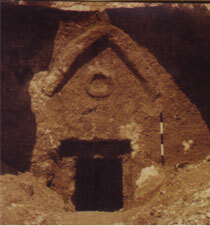 In the film “The Lost Tomb of Jesus,” one of the goals of the production team story was to find a mysterious tomb with a very special symbol above the door, which they had seen in a photograph. The director Simcha Jacobovici and his crew, after a tremendous preparatory effort, set out to find the tomb, zeroing in on the suspected area with ancient maps and builder’s scale models of the development where the tomb was first unearthed. The search narrows down to two concealed tombs in a building development in the East Talpiot suburb of Jerusalem. A major setback arises when the investigative team find the wrong tomb and then set out to “find” the other. Felix G: So what’s next? Simcha J: We’ve got to find the tomb, the Holy Family tomb. Felix G: We’ve got to be looking 20 meters south. Crew: It’s going to be on the other side of this building. Felix G: Yeah. It’s this way. Where are you going? Where the heck are you going, Simcha? That’s the parking lot. Simcha J: Shouldn’t be a big deal. South is south. Twenty meters takes us in the garden. Twenty meters is not much. We’re okay. The story of the finding of the tomb was very enlightening and entertaining. The director himself climbs distant walls (with the actual tomb in the foreground of the camera all the time!). They stand at a distance talking to neighbors who point out the actual tomb still in the camera’s foreground. Then they intend to “democratize” the inaccessible tomb for all mankind even if it takes breaking the seal on the modern cement structure which is intended to block the world’s access to this “Holy Family Tomb”, the true tomb of Jesus. The identity of the tomb was stigmatically confirmed by a stylized “cross”—the “chevron” with an “all seeing eye” peering out from its midst. The director himself helps to push the heavy manhole cover away from its opening and sees the sacred emblem for the first time. And then he gasps at what he sees. The chevron’s legend had evidently preceded the “rediscovery” of the Tomb. The story of the chevron and all of its implications continues to grow, in the film, in the book and on the official web site in our very day! This was nothing more than a staged reenactment of the investigative reporter’s activities. However these are mixed with some fictitious elements. The filmmakers actually knew where the tomb was all along. The tomb had been identified for them by photographs taken of the sealed structures a year earlier. But it provided a great dramatic effect, right? Does this artistically disposed reenactment fall under the covering of being the legitimate artistic license of the filmmakers? And if so, perhaps more importantly, how does the audience feel about this presentation of the story? Does this leave them satisfied with the way that the “facts” have been reported to them? First of all, the viewer does not realize that this was a reenactment. There is no subtitle that informs them of this. They also do not realize the fictitious elements that have been added to the story. And even if they do, they are not in a position to discern what is fact and what is part of artistic license. The story continues . . . . .